This past April, Argonne postdocs were asked to offer their expertise in judging the Skyway Science, Technology, Engineering and Mathematics (STEM) Poster Competition. The Skyway STEM Contest is designed to encourage area community college students to participate in STEM research. The student participants come from one of the community colleges in the Illinois Skyway Collegiate Conference, which include the College of Lake County, Elgin Community College, McHenry County College, Moraine Valley Community College, Morton Community College, Oakton Community College, Prairie State College and Waubonsee Community College. There were 34 posters from individuals and teams in the areas of Life Sciences, Earth Science, Physical Science, Chemistry, Technology, Physics, Computer Science, Math and Engineering. 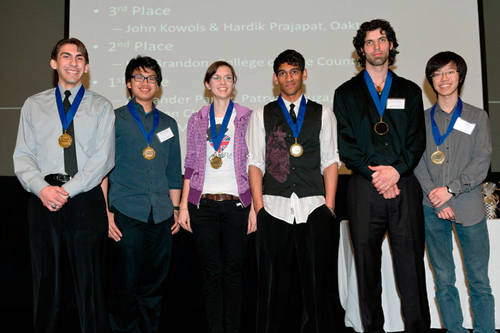 Twelve Argonne postdocs served as the judging team for the competition. They were charged with the task of evaluating posters for content, design and then interacting with the students to judge presentation skills. The postdocs serving as the judging team. 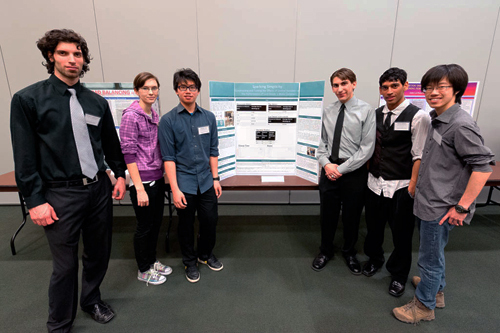 First Row, Left to Right: Martin Alcorta (PHY), Kurt Frey (CSE), Chithra Nair (PHY), Shanshan Liu (ES), Yuki Hamada (ES) and Michael Slater (CSE).Second Row, Left to Right: Sunshine Silver (CSE), Erin Iski (CNM), Sri Hari Krishna Narayanan (MCS), Daniel Smith (CLS), Maricris Mayes (LCF), and Kah Chun Lau (MSD). Alex was first introduced to the Skyway STEM competition by his chemistry professor. He was thrilled with what he saw and never imagined that such opportunities were available to community college students. Alex learned many things along the way during the competition such as how to approach a problem, finding a solution and achieving a goal as part of a team. “The most valuable lesson was my realization that a research project does not always go exactly as planned. Often, you come across unforeseen obstacles that set back a project. This forces you to reevaluate your entire approach to a problem,” says Alex. Alex also is a member of the U.S. Department of Energy Community College Internship (CCI) at Argonne. This program gives community college students like Alex the opportunity of performing science alongside world-class scientists. Alex is working in Argonne’s Physics Division with Zachary Conway (PHY), assistant accelerator physicist. He is working on a project that covers understanding the fabrication of niobium resonant cavities — one of the main accelerating components used in the Argonne Tandem Linac Accelerator System (ATLAS). It is a project which has given him a theoretical understanding of some of the real-world methods and design choices employed by scientists. It also has provided him with the opportunity to work directly with materials and gain experience in hands-on and technical skills. He has found the CCI program to be an invaluable experience. “As a community college student, the opportunities I have for advanced STEM coursework and research experience are severely limited. Through programs like CCI, however, a community college student can be exposed to modern research and gain experience solving problems above and beyond what is found in the classroom,” says Alex. He feels the significance of this STEM exposure and experience is immensely beneficial to him and those going into the field of research, engineering and applied science. Because of Alex’s experiences in the Skyway STEM competition and DOE’s CCI program he has developed an appreciation of physics. “I love how physics applies to everything and is so fundamental to our understanding of the universe. I feel that physics, above all else, is a science that focuses less on simply understanding concepts and more on being able to apply your conceptual understanding to solve complex problems,” notes Alex. This fall Alex will attend the University of Illinois at Urbana-Champaign. He has decided to pursue a career in physics research. He plans on enrolling in a Ph.D. program after he obtains his bachelor’s degree. Opportunities such as the Skyway STEM competition provide both the postdocs and the competition organizers a rewarding and positive experience. Through interactions with postdoctoral scientists, community college students, like Alex, receive encouragement and feedback that will help them as they move forward with their education. The postdocs hone their skills as well in evaluating and discussing complex research topics with undergraduate students. The Skyway STEM organizers, Lisa Kelsay, Pamela Goodman and Dana Campbell, and all of Moraine Valley Community College, were quick to extend the invitation to Argonne to judge next year’s Skyway STEM Poster Competition. Argonne is happy to accept. View the STEM 2012 Program Brochure for more information.